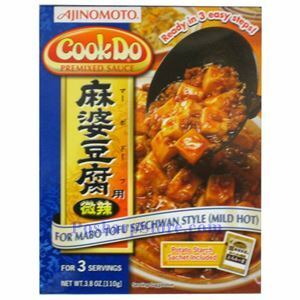 This Ajinomoto CookDo premixed sauce is made in Japan for cooking Sichuan style mabo or mapo tofu with mild spicy. It is a combination of fresh garlic with black-bean paste, red pepper and Szechwan peppercorns for the spicy, full-bodied flavor of authentic Szechwan-style cuisine. Simply add to stir-fried minced pork. Water, Soy Sauce(water, soybean, wheat, salt), Garlic, Sweet Sauce(soybean, sugar, water, salt, wheat), Chili Paste(red pepper, rice), Sesame Oil, Sugar, Soybean Oil, Fermented Black Bean, Potato Starch, Monosodium Glutamate, Chili Oil, Sake, Broad Bean Paste, Chicken Extract, Xanthan Gum, Salt, Pepper Powder, Paprika.